You may be hostile to the God of the Bibleor maybe youre a dutiful Christian whose faith is dry and stale. Dr. John K. LaShell draws on Jonathan Edwards to explain the beauty of God. He writes for two kinds of readers: those who suspect God is unlovely, and those who want to love Him more. John K. LaShell holds the BA from Moody Bible Institute, the MA from Talbot Theological Seminary, and the PhD from Westminster Theological Seminary. He has written numerous articles for local newspapers and several for theological journals. He was also a contributor to the Blackwell Dictionary of Evangelical Biography, 17301860. He has taught for-credit humanities classes at a Penn State regional campus, and non-credit theology classes for students at Kutztown University and in the former Soviet Union. He entered the pastoral ministry in 1970 and for the past fifteen years has served a Conservative Baptist congregation in Allentown, Pennsylvania. Dr. LaShell has been greatly influenced by the theology of Jonathan Edwards, and this influence is clearly reflected in The Beauty of God for a Broken World. He and his wife Heather have two married children and four grandchildren. Dr. John K. LaShell explains the beauty of God for two kinds of readers: those who suspect God is unlovely, and those who want to love Him more. 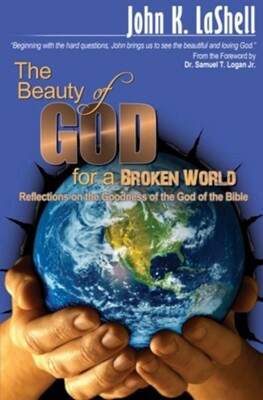 I'm the author/artist and I want to review The Beauty of God for a Broken World: Reflections on the Goodness of the God of the Bible - eBook.